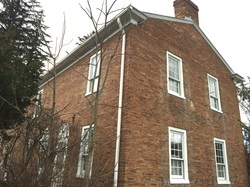 ​Full House History: Carol Sisler, "The Wonderful Brick Farmhouse of Savage Farm"
The two-story red brick building now on Kendal at Ithaca property along North Triphammer Road is known as the Manning-Labar Farmhouse. According to former Cayuga Heights Village Historian Carol Sisler, the home was built sometime between 1810 and 1829. It is a candidate for the oldest home in Cayuga Heights. The facade of the original part of the house is distinctively symmetrical, with two side-by-side front doors flanked by nine-over-six pane windows. It has a side gable that faces the road and a low-pitched roof with chimneys on each end of the house. A later addition extended the house to the west, maintaining the plain brick exterior but disrupting the Georgian symmetry. The foundation is brick, which is an atypical feature for Tompkins County, suggesting that the builder of the home drew on an architectural tradition from another region. The property surrounding the Manning-Labar Farmhouse was from about 1808 the “homestead” of Richard (1777-1827) and Lydia Vaughan (1778-1848) Manning. Richard Manning’s parents Ephraim (1747-1819) and Joannah Manning and several of their adult children migrated from Morris County (today’s Sussex County), New Jersey, to the Township of Ulysses before 1800. Ephraim had served as a militia private in the Revolutionary War. A decade later, the Manning family's fortunes had improved. In 1808, Richard and Lydia purchased property from Lydia’s father Daniel Vaughan on Military Lot 89. The 83-acre farm stretched westward from what is now North Triphammer Road to the middle of today’s Kendal at Ithaca property. The property ran from Hanshaw Road to the southern boundary of the Village of Lansing. By the time of Richard’s death in 1827, he and Lydia owned almost 400 acres in northeast Ithaca, including the original Manning homestead as well as a six-acre mill lot on Fall Creek. However, Richard left $2,990 in debts to be paid off through the sale of some of their property. 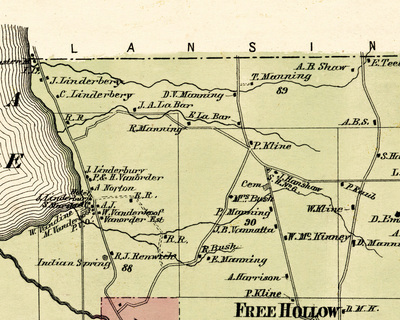 Lydia remained living at the Manning homestead “as part of her dowry as widow of said Richard Manning.” Of the couple’s children, Daniel V. Manning is shown as living at the property on the 1866 Tompkins County map. Daniel Van Manning died in 1870. 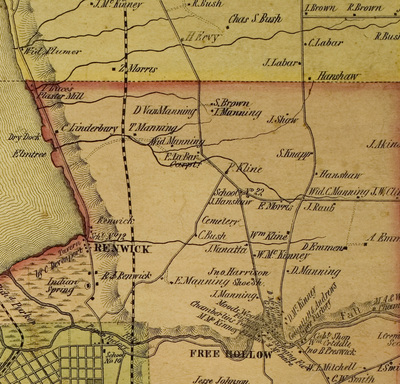 Tompkins County maps from 1852 and 1866 show "D Van Manning" and "D.V. Manning" living at the Manning homestead property. Daniel V. Manning, who died in 1870, was Richard and Lydia's son. In 1920, the property was sold to Elmer Savage (1884-1943) and Genevieve Savage. Elmer Savage was a Cornell professor of Animal Husbandry who was internationally known for developing feed standards for dairy cows. He operated a dairy farm on the former Manning farm and bred Guernsey cows. Cornell University purchased the lot in 1968, and in 1994 the Kendal retirement community bought the property. ​​ Architectural analysis by Forest Home Historian Bruce Brittain, email communication, November 21, 1995. Tompkins County Clerk's Ithaca Deeds Liber V Pages 168-169. John Manning Stewart, Some Descendants of Ephraim and Joannah Manning of New Jersey and Tompkins County, New York, Compiled June 1995. New York (State), Comptroller's Office. Tax assessment rolls of real and personal estates, 1799–1804, Series B0950 (26 reels). Microfilm. Albany, New York: New York State Archives.